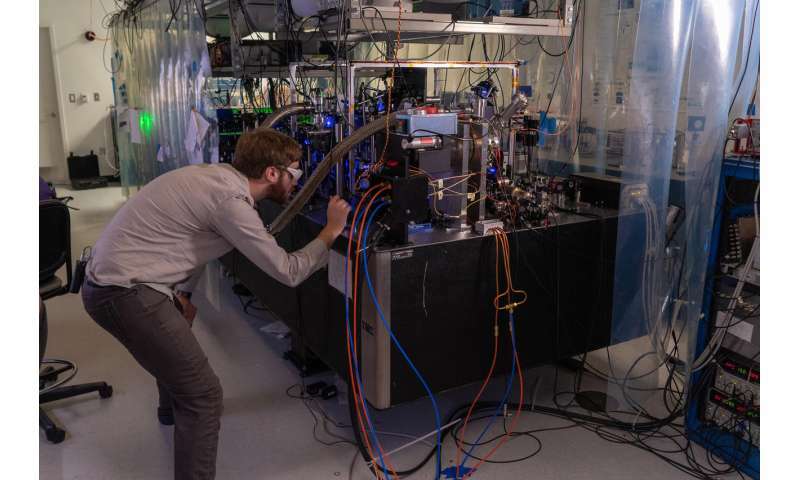 Rice University physicists have created the world's first laser-cooled neutral plasma, completing a 20-year quest that sets the stage for simulators that re-create exotic states of matter found inside Jupiter and white dwarf stars. 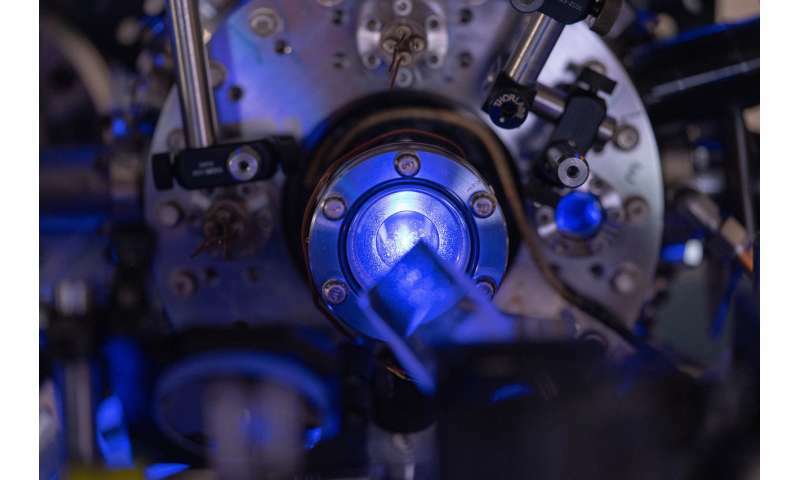 "We don't know the practical payoff yet, but every time physicists have laser cooled a new kind of thing, it has opened a whole world of possibilities," said lead scientist Tom Killian, professor of physics and astronomy at Rice. "Nobody predicted that laser cooling atoms and ions would lead to the world's most accurate clocks or breakthroughs in quantum computing. We do this because it's a frontier." Killian and graduate students Tom Langin and Grant Gorman used 10 lasers of varying wavelengths to create and cool the neutral plasma. They started by vaporizing strontium metal and using one set of intersecting laser beams to trap and cool a puff of strontium atoms about the size of a child's fingertip. Next, they ionized the ultracold gas with a 10-nanosecond blast from a pulsed laser. By stripping one electron from each atom, the pulse converted the gas to a plasma of ions and electrons. Energy from the ionizing blast causes the newly formed plasma to expand rapidly and dissipate in less than one thousandth of a second. This week's key finding is that the expanding ions can be cooled with another set of lasers after the plasma is created. Killian, Langin and Gorman describe their techniques in the new paper, clearing the way for their lab and others to make even colder plasmas that behave in strange, unexplained ways. Plasma is an electrically conductive mix of electrons and ions. It is one of four fundamental states of matter; but unlike solids, liquids and gases, which are familiar in daily life, plasmas tend to occur in very hot places like the surface of the sun or a lightning bolt. By studying ultracold plasmas, Killian's team hopes to answer fundamental questions about how matter behaves under extreme conditions of high density and low temperature. 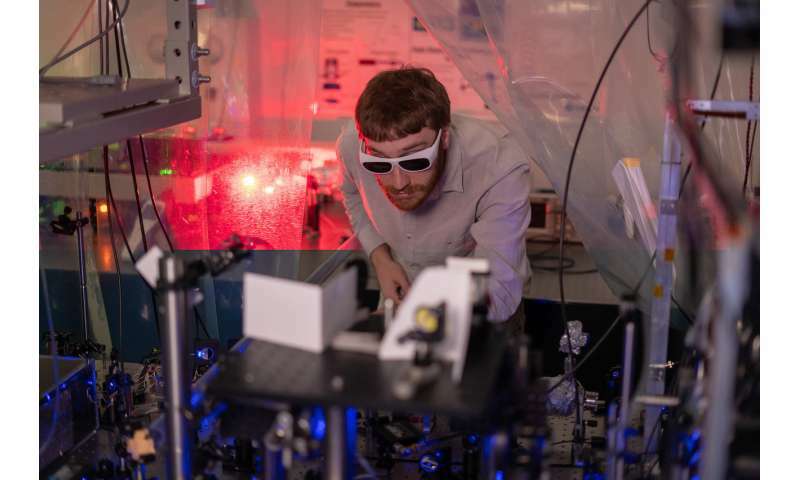 "If an atom or ion is moving, and I have a laser beam opposing its motion, as it scatters photons from the beam it gets momentum kicks that slow it," Killian said. "The trick is to make sure that light is always scattered from a laser that opposes the particle's motion. If you do that, the particle slows and slows and slows." During a postdoctoral fellowship at the National Institute of Standards and Technology in Bethesda, Md., in 1999, Killian pioneered the ionization method for creating neutral plasma from a laser-cooled gas. When he joined Rice's faculty the following year, he started a quest for a way to make the plasmas even colder. One motivation was to achieve "strong coupling," a phenomenon that happens naturally in plasmas only in exotic places like white dwarf stars and the center of Jupiter. "We can't study strongly coupled plasmas in places where they naturally occur," Killian said. "Laser cooling neutral plasmas allows us to make strongly coupled plasmas in a lab, so that we can study their properties"
"In strongly coupled plasmas, there is more energy in the electrical interactions between particles than in the kinetic energy of their random motion," Killian said. "We mostly focus on the ions, which feel each other, and rearrange themselves in response to their neighbors' positions. That's what strong coupling means." "Strongly coupled ions can't be near one another, so they try to find equilibrium, an arrangement where the repulsion from all of their neighbors is balanced," he said. "This can lead to strange phenomena like liquid or even solid plasmas, which are far outside our normal experience." In normal, weakly coupled plasmas, these repulsive forces only have a small influence on ion motion because they're far outweighed by the effects of kinetic energy, or heat. "Repulsive forces are normally like a whisper at a rock concert," Killian said. "They're drowned out by all the kinetic noise in the system." Killian's team creates plasmas that are orders of magnitude lower in density than those inside planets or dead stars, but by lowering the temperature they raise the ratio of electric-to-kinetic energies. At temperatures as low as one-tenth of a Kelvin above absolute zero, Killian's team has seen repulsive forces take over. "Laser cooling is well developed in gases of neutral atoms, for example, but the challenges are very different in plasmas," he said. "We are just at the beginning of exploring the implications of strong coupling in ultracold plasmas," Killian said. "For example, it changes the way that heat and ions diffuse through the plasma. We can study those processes now. I hope this will improve our models of exotic, strongly coupled astrophysical plasmas, but I am sure we will also make discoveries that we haven't dreamt of yet. This is the way science works." The research was supported by the Air Force Office of Scientific Research and the Department of Energy's Office of Science. Must be a joke since they have been studying plasma for many decades.